Minimize project risks, improve quality, increase efficiency, and reduce costs! BIM is one of the most revolutionary and impressive innovations in the history of the construction industry, with countless advantages, optimization potential, and opportunities. Autodesk Revit facilitates this and TheModus Suite takes care of the rest! For BIM to work effectively, it's important to assign the right people the right responsibilities and ensure an optimum process, from conception to implementation. It all starts with the use of smart building components, consistent information and smart methods and techniques. 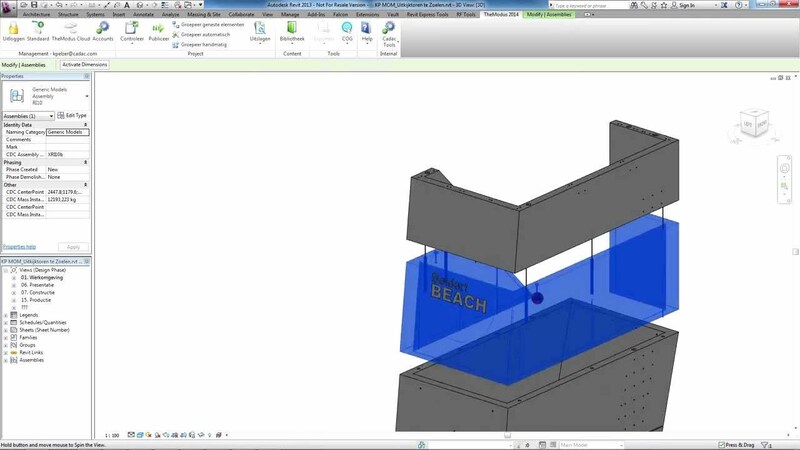 The consistency of the information should be checked to make sure it meets the client's needs: easy access and immediate graphic conversion in Revit. Take control of your BIM models and BIM processes with TheModus Suite! TheModus Suite allows you to make each step in the building process faster, more efficient, and cost-effective. Check whether your design meets the client's requirements and use tools to improve productivity and efficiency. Combine the power of valid content and smart solutions to optimize your processes and reduce risks. The effectiveness of a BIM model depends on the quality of the information in the model. With TheModus Suite, the quality of your information translates into your added value! TheModus Suite will increase your efficiency by helping you complete high-quality projects in the shortest possible time at the lowest rates! Significantly reduce your project time with our efficient solutions. Use our smart Revit Families, high-end solutions and useful tools to finish your projects faster. We use Revit and Microsoft technology to facilitate the continuity of all phases in the BIM process. The next party in the chain can easily pick up where you left off in the BIM model. TheModus Suite is a cloud-based platform for architects, consultants and engineering firms, contractors and installers who use Autodesk Revit. TheModus Suite offers perfect solutions for creating, documenting, reporting and analyzing BIM models. This helps you work more efficiently with construction partners and clients. In addition, TheModus allows you to link to sofware packages used by third parties. TheModus Suite Standard is ideal for installers, advisors and building managers that want to connect their familiar 2D or 3D AutoCAD environment with BIM. With proven solutions Nordined and Techline in the Standard Suite you can create and manage your E- and W- installations effortlessly and directly in AutoCAD. Techline offers additional 3D design functionality for installers and installation advisors. Techline is ideal for the development of technical rooms and shafts, in which the coordination of installations is extremely important. In addition, you can generate any realistic view or section from a 3D model in an instant. This suite is the perfect solution for creating, documenting, reporting, and analysing BIM models for architects, advisers, engineers, contractors, and installers who use Autodesk Revit. The Premium Suite facilitates an efficient partnership with your construction partners and clients. Modellers can speed up their design process by using productivity-improving tools and process-supporting tools, integrated with proven market solutions. All stakeholders can easily share information in a user-friendly and uniform way. Generate all necessary views based on the information in the information in no time. Furthermore, TheModus helps you with the coordination and communication between the different parties within your project. The Ultimate Suite helps you achieve the highest possible production and efficiency levels. Apart from the many advantages in the Premium Suite, you benefit from even more tools in the Ultimate Suite. Get the most out of your project with TheModus Documentation. In no time you generate sales, construction, installation and production drawings of a complete BIM project. Moreover, the Modus Center of Gravity calculates in an instant the centers of gravity in your BIM model. With this solution you will definitely cut down working hours and avoid failure costs during your process. TheModus Suite contains the following solutions for faster, more efficient, and higher-quality BIM projects. 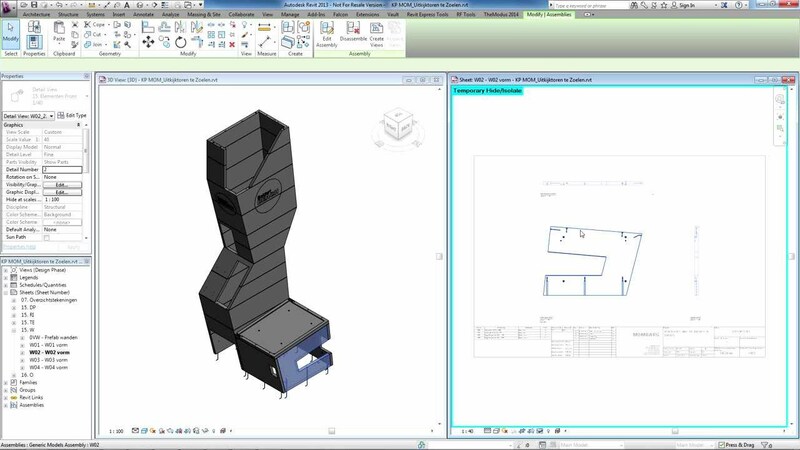 Quickly and easily determine the centre of gravity of one or more objects in your Revit model. Quickly generate clear work drawings, presentation drawings, maps, installation plans, and tender drawings in Revit. Quickly generate views and sheets from all the information available in your BIM project. Draw and manage technical installations with this proven 2D design solution. Design your technical installations in 3D to simplify the coordination and communication with your construction partners. Model your BIM models using a cloud-based, multidisciplinary, and unified library consisting of 100% native Revit technology, which is suitable for all phases and all partners in the building process. In no time at all, collect the information necessary to perform a lighting calculation in Dialux. Design and calculate simultaneously in your Revit model, and use Vabi's proven calculation methods to continuously monitor the performance of the design. Quickly and easily label BIM components in your BIM model so that only the correct information is visible in the documentation. Generate clear and structured reports based on your BIM model containing both your desired and/or required information, such as spatial charts, quantities, and daylight calculations. It is also possible to report reinforcement schedules for the production of reinforcements. In addition to the Cadac TheModus Suite, we often recommend the Cadac Organice Suite to users. When you manage large and complex projects on a daily basis, the Cadac Organice Suite is the comprehensive solution for managing and sharing documents. It is with good reason that we call the Cadac Organice Suite the leading engineering collaboration solution based on Microsoft SharePoint and Autodesk Vault. Project-driven engineering companies around the world use the Cadac Organice Suite with great success. It is the ultimate suite for the management of project documents, CAD drawings, workflows, and document release and distribution. Our software is based on more than 30 years of experience in the engineering industry and is available as an on-premise, cloud, and hybrid solution.